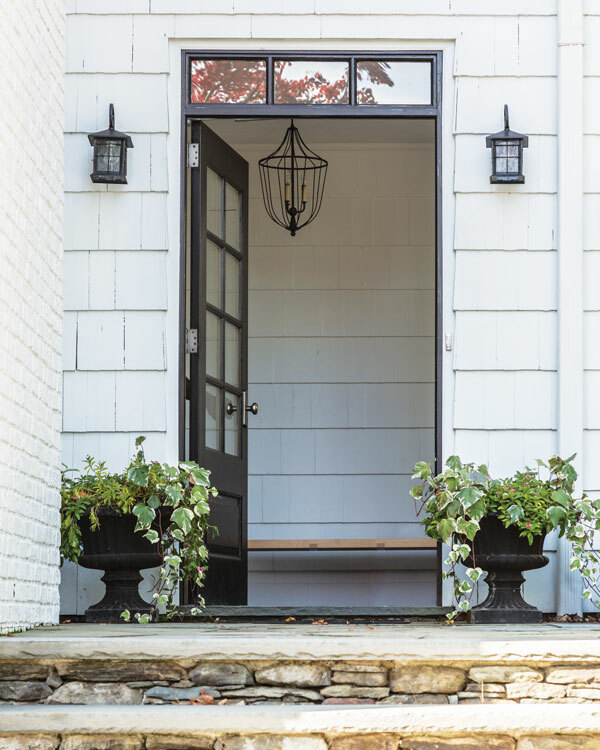 A simple but welcoming entryway leads into this vestibule, where designer Elizabeth Vizzone and her guests can get their bearings and attend to their belongings before making their way inside. The home’s overall aesthetic of streamlined elegance never deviates from the first steps into the foyer. When Vizzone purchased her home, the shutters were missing from the first-floor windows. In addition, the French doors leading to the living room had lanterns on both sides, appearing to signal the main entrance, which is actually on the right of the house at the top of the driveway. Vizzone restored the exterior to its grandeur by commissioning new shutters and removing the lighting from the French doors. Vizzone keeps her home’s color palette uniform, with lots of black and white and rare pops of color. The effect is visually restful. It also gives her lots of flexibility when rearranging furnishings. 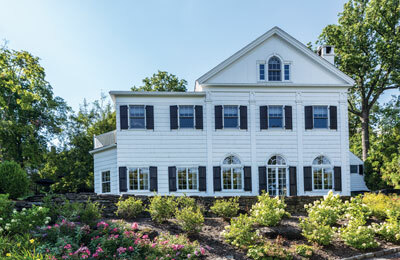 Many of the home’s furnishings were repurposed from the family’s previous residence in Essex Fells, a modern structure. To make them work in a traditional setting, Vizzone whitewashed the home’s walls and trims and refinished floors in a dark stain. 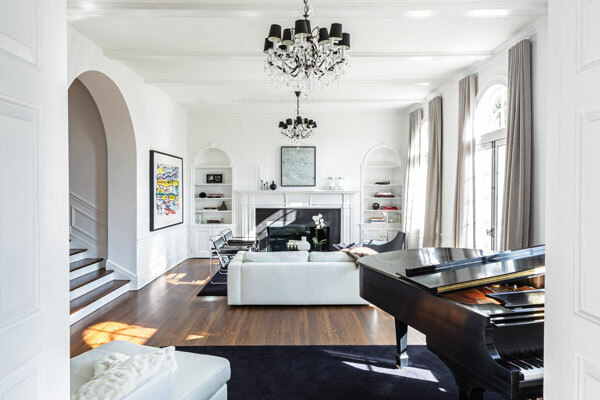 “Just because you have contemporary tastes, doesn’t mean you can’t have a traditional home,” she says. A small breakfast area has a big retro-modern personality with Knoll chairs, Fornasetti pillows and a George Nelson clock. Just beyond lies a traditional butler’s pantry. Vizzone married the disparate styles with consis­tency in the walls and floors. The elegance of the family room belies its practicality. The Kartell tables are durable and a cinch to clean. And white leather holds up better than black with proper care, Vizzone says. The floor lamp looks almost like photographer’s equipment; its top can be rotated to cast light anywhere. The dining room table is large, with any potential starkness offset by the undulating outlines of the chairs. Clean lines and cool furnishings in the master bedroom get some visual balance from an ultra-plush flokati rug. It also feels great under foot. The sitting room outside of the master bedroom came together around artist Donald Baechler’s Flowers prints. Vizzone allowed each of her children to personalize their bedrooms. She maintained visual harmony and tranquility with consistent flooring and also by hanging the same window treatments in each room. The daughter’s room includes a paisley wall covering. All of the children’s bedrooms were designed to grow with them. Vizzone’s son’s room reflects his love of sports through a sophisticated use of color and materials. The office is tucked away in a far corner on the ground floor with an anteroom that overlooks the backyard. Its small size meant Vizzone needed to economize on furnishings. When designing a room, start by removing what isn’t necessary or what you no longer love, Elizabeth Vizzone advises. 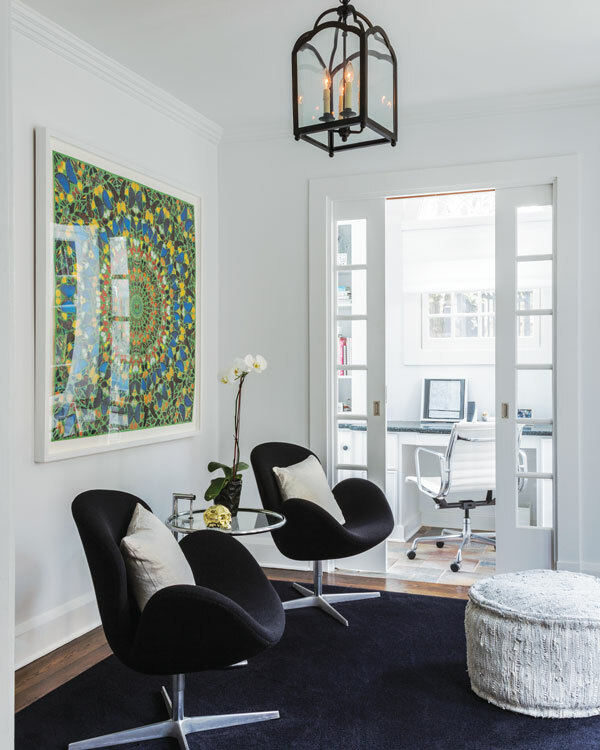 Vizzone, who is also a licensed Realtor, kept things astoundingly simple when moving from a modern home in Essex Fells, NJ to her current colonial-style home, reusing nearly all of the furniture from her previous residence. How do you take furnishings designated for a particular style of house and make them work in an entirely different setting? Magic might be one explanation. But Vizzone, who formerly worked for Polo Ralph Lauren and Calvin Klein, says style is much more than what you buy and use to fill a space. “You just have to have an eye for it and put it together the way your instincts tell you,” she says. Indeed, those pieces speak loudly. Her choice in furniture and accessories is often stark and bold. But in every room, she softened the look with a skillful mix of textures—plush carpets, mottled skins, shimmering crystals, gleaming steel. In existing homes, she likes to start with the basics. Accessories are easily affordable and can be changed seasonally—a cotton throw on the sofa in the summer, a wool throw for the winter. She also believes in heavy editing, which she says is crucial to maintenance. Remove whatever isn’t necessary or what you no longer love. And if you truly can’t bear to part with something, store it. You never know where you can work it back in. “Everything in your surroundings should feel good,” she says. She also rejects the idea that you need to spend a lot of money to have great style. In her home she uses Ikea silver floor lamps she purchased for about $50 each. They are nearly identical to Ralph Lauren lamps that cost thousands, she says. Where color is concerned Vizzone is conservative, and she tends to keep things simple, uniform and fluid. It’s restful to the eye, suits her modern tastes and also makes it easier to rearrange furnishings—a plus for a busy mom. In fact, she’s endlessly and unapologetically restyling her own space, as one might expect. Overall: interior design, Elizabeth Vizzone Interiors in Montclair; landscaping, Carlos Interiano in Hopatcong; exterior painting and shutters, Wilber’s Painting in Maplewood. Vestibule: chandelier, Ballard Designs in West Chester, Ohio; mirror, custom by Sky Frame Inc. in New York City; large vase, Fornasetti; table and X-benches, Jonathan Adler in New York City; skin rug, Amazon.com; chair, Design Within Reach in Secaucus. Living Room: chandeliers, Restoration Hardware; art over fireplace, Jose Camacho in Montclair; white leather sofa and chaise, Design Within Reach; piano, Steinway; rugs, A&S Carpets in Newark; black leather chaise, B&B Italia in New York City; coffee table, Jonathan Adler; sling chairs, Le Corbusier through Design Within Reach; silver task lamps, Ikea; window treatments, Mark Dahan of A&M Window Fashions in New York City. 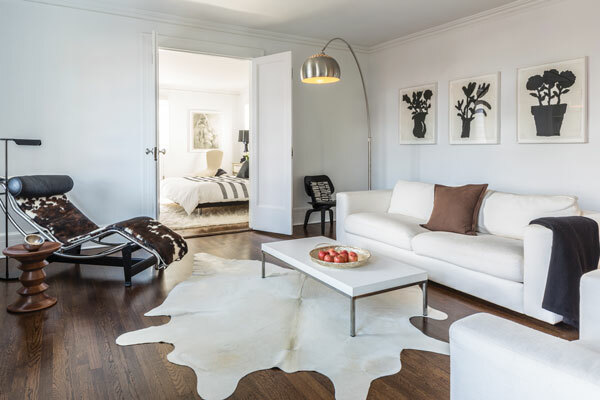 Family Room: sofa, Design Within Reach; pillows, Fornasetti and Ikea; stacking tables, Kartell in New York City; rug, A&S Carpets; window treatments, A&M Window Fashions; lighting fixture, Fortuny through Design Within Reach; task lamps, Ikea. Dining Room: chandelier and table, Restoration Hardware; chairs, CB2; rug, A&S Carpets; art, Jose Camacho; storage cabinets, White on White in New York City. Breakfast Area and Butler’s Pantry: table and chairs, Knoll in New York City; pillows, Fornasetti; light fixture, All Modern; clock, George Nelson; art, Portobello Road in Edgartown, Mass­a­­chusetts. Master Bedroom: bed, Design Within Reach; bedding, Calvin Klein Home in New York City; chair and footstool, Knoll; night tables, Pottery Barn; lamps, Kartell; reading lamps, Ikea; rug, Amazon.com. Master Bedroom Sitting Area: sofa, chair, Le Corbusier chaise, George Nelson stool and Arco?floor lamp, all through Design Within Reach; coffee table and task lamp, Ikea; skin on floor, Amazon.com; art, Donald Baechler in New York City. 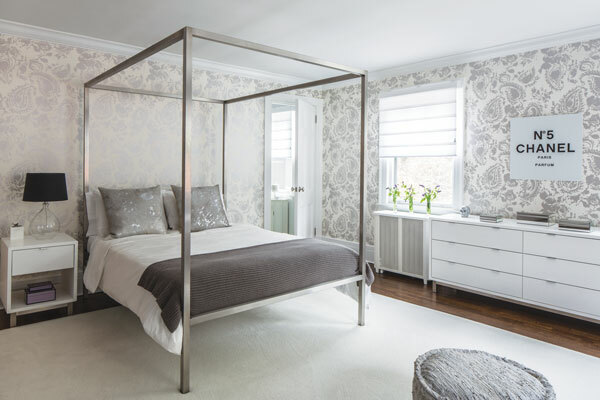 Daughter’s Bedroom: bed and furniture, Room and Board; bedding, Calvin Klein Home; art, Art.com; night table lamp, Target; rug, A&S Carpets; stool, Calypso in Short Hills; wallpaper, Ralph Lauren Home. Son’s Bedroom: bed, night table, bookshelf and art, Restoration Hardware; task lamp, Ikea; chair, Knoll.